"I doubt seriously whether a man can think with full wisdom and with deep convictions regarding certain of the basic international issues today who has not at least reviewed in his mind the period of the Peloponnesian War and the Fall of Athens." - George C Marshall, 1947"And, perhaps, my account will seem less pleasing to those who hear it because of its lack of fabulous tales, but if it be judged useful by those who seek an exact knowledge of the past as an aid to the interpretation of the future, which in the course of human things must resemble if it does not reflect it, I shall be satisfied." - Thucydides, History of the Peloponnesian WarDonald Kagan, one of the preeminent Classical scholars of the last 50 years, who has spent most of his professional career writing and researching the Peloponnesian War has written a tight book exploring Thucydides as a historian, philosopher, and comparing the myth of the Man/Historian/Philosopher against the reality. Kagan investigates Thucydides motives, revisions to history, and opinions. It is an interesting biography of a historian combined with a light textual analysis of his book. It is a historical love note, with just a dash of realism and hint of criticism. It is also, put in today's context, not a little bit ironic. Each time I've read about the Peloponnesian War I finish the book or article thinking of how Thucydides was an early master of real politick. I think about how Athens invading Sicily strangely parallels the US preemptively invading Iraq, waging war against the "enemies of democracy" and the "axis of evil". I was going to make some snarky comment about how hard it must be for Donald Kagan, this historian of the brilliant and pragmatic historian/philosopher/general Thucydides, to share a name with Robert Kagan one of the neocons responsible for providing intellectual cover for the last couple decades of American Imperialism. Imagine my surprise to discover that Donald is John's father. Gods. What a Greek Drama there. I just can't decide if having Robert Kagan be Donald Kagan's son is more of a comedy, satire, or tragedy. Some lessons just don't get shared with sons I guess. Well, perhaps they do, but only when they are carved into marble. A friend asked me about this book. Here is what I wrote to him...Of course I recommend the book...It's Donald Kagan on Thucydides!!! I admit that I have only inspected the book and have not yet given it the complete reading it obviously deserves. But here's my preliminary impression.First off, the book develops themes that Kagan has presented in some of his previous work, especially in a brief (and quite insightful) article he wrote about 20 years ago called something like, "The First Revisionist Historian." Also, some points in the book previously appeared in Kagan's biography of Pericles, others in vol. 1 of his four-volume series on the Peloponnesian War, and still others in chapter 1 of his fine book, On the Origins of War and the Preservation of Peace. In short, there does not appear to be a lot of new stuff in this book.Second, Kagan reads Thucydides primarily with historical questions in view. This is, of course, legitimate and important, but such a reading necessarily overlooks other aims of Thucydides' project. Thus, to assess Thucydides as a historian is to assess only one dimension of Thucydides. To his credit, Kagan understands this. But a reader should be aware that there is far more going on in Thucydides than what Kagan chooses to interact with.Third, the book displays Kagan's remarkable clarity and depth. Few equal him in either attribute.Fourth, Thucydides is the premiere political historian, and delivers a powerfully nuanced political philosophy through his narrative. His greatest followers, Machiavelli and Hobbes, towering figures though they were, could not rise to Thucydides' level. What I quarrel with in Thucydides--adamantly--is his view that political explanations are total explanations. On this point I fall squarely on the side of Herodotus over against Thucydides. I join Herodotus when he takes social and cultural matters seriously in historical analysis. But on this question Kagan sides with Thucydides. I don't buy in to the old-time tendency to privilege political history that Kagan celebrates.Finally, if you buy only one book by Kagan, get his one-volume Peloponnesian War or On the Origins of War. If you buy only one book on Thucydides, I would put this one in line behind both Clifford Orwin's The Humanity of Thucydides and Gregory Crane's Thucydides and the Ancient Simplicity. Does that mean that Kagan's book on Thucydides is not worthwhile? Not at all. Read that one too! This writer on Thuc isn't for me; I found his interpretations influenced by his views on the present day (and I differ from his politics). But then it bugs me that Thuc is enlisted in our world affairs the way he is. If you haven’t read any Kagan before, better to start with his majestic Pericles Of Athens And The Birth Of Democracy. Donald Kagan starts out with a simple thesis: Thucydides, who is widely renowned in modern times for giving "just the facts" in his history, is not entirely free from bias in his History of the Peloponnesian War... in fact, his point was to convince his contemporaries to accept a radically different view of the war than was popular in his day. Contemporaries blamed the war on Pericles, but big T, who had long been a supporter of Pericles, argued that the war was systemic and inevitable. They also blamed Nicias, another man T admired, for the failure of the Sicilian expedition. T says no, it was the fault of demagogueic post-Periclean democracy. Kagan points out how T can be selective in his reporting in order to show his side of the story... but after basically ripping on T for the whole book, in the final chapter Kagan makes it clear that he still admires Thucydides (as one would expect, since Kagan has dedicated much of his professional career to T and the Peloponnesian War), and that most of the evidence he uses against T comes straight from T's history: in short, while even T could not completely escape bias in his conclusions, he was still a model historian because he gave the facts so that many conclusions could be drawn. Kagan also speaks up for political history in the last few pages, defending it against the ever growing tide of social and cultural history that now dominates.This book was really engrossing. I knew very little about the Peloponnesian War before reading the book, but Kagan fills in the basic for neophytes like myself, and the narrative of the war is well balanced with his analysis. It seems written for a fairly general audience, but you will probably need some interest in history to care about whether or not Thucydides was biased. I was fascinated by Kagan's reinterpretation of Thucydides and Kagan's faith in democracy -- a faith I believe Thucydides rightly didn't share. I wondered what the author meant when he said that Thucydides was writing a revisionist history since he was the first one writing a history of the Peloponnesian War. He had two goals in mind to revise what he thought were errors in contemporary thought on the subject and to leave an objective record for future readers. The author disagrees with many of Thucydides' interpretations of event, yet finds that he has left a clear record for later readers to come up with their own interpretations and understanding of events. For instance, Thucydides lays more blame upon the sort of democracy that would lead to rash decisions about the invasion of Sicily rather that the architect of the disaster, Nicias. Contemporaries and the author believe that Nicias should have abandoned Sicily while there was still time to save his army. He didn't due to fear of being put to death when he returned to Athens having failed in his expedition. Consequently his whole army was destroyed. There is a discussion of the workings of the Athenian democracy. During Pericles' lifetime about 50,000 people were considered citizens and in any given time about 5.000-6,000 would show up at the assemblies held on a hill called the Pnyx. The citizens sat on the hill and listened to speakers on a low platform. The meetings were called when needed and would approve and disapprove measures, pick generals, etc. Thousands citizens were too many to conduct business without help so they had a Council of Five Hundred, chosen by lot among the citizens. This councils main job was to prepare legislation for consideration by the people. In the end the vote would be a simple majority among the whole of the citizens at a meeting.There were a great number of public servants chosen by lot by the assembly;such things as market inspectors were even chosen by lot.Juries consisted of from 51 to 1501 jurors. There was a very complicated selection of jurors to prevent any kind of bribery. Trials were held in just one day. The litigants would make their testimony and then there would be a vote. The trials despite their many flaws were simple, speedy and open. If a plaintiff did not win a certain percentage of the votes they would have to pay a hefty fine which was a way of preventing frivolous law suits. I quite enjoyed this work and am happy to learn about the first political historian and the Greek historian who had the greatest influence upon later ancient historians and his influence on those of modern times. The title of this book is a partly misleading. Though Kagan does an excellent job of supporting his view that Thucydides was the world's first revisionist historian, this short, insightful, and well written book goes much further than merely critiquing Thucydides History. It provides the reader with a deeper understanding of the context and some of the key events of the Peloponnesian War.The common thread that links the themes of the book is the influence the democratic system had on Athenian decision-making both before and during the war. Kagan highlights Thucydides' different treatment of Athenian democracy during the Periclean, and post-Periclean periods. Thucydides' disdain for the demagoguery that afflicted Athens following the death of Pericles, Kagan argues, influenced his telling of the history of this period. One can't help walk away from Thucydides description of the Sicilian Expedition and the treatment of Nicias, in particular, without appreciation the author's apparent frustration with the events as they unfolded. However, Kagan, drawing on other ancient commentators, as well as Thucydides' own words, puts forward a convincing argument that though the democracy was be no means blameless for the strategic failures of the latter parts of the War, it's actions by no means preordained the failures that befell it.In all, this is well worth the read for anyone with even a passing interest in the Peloponnesian War, or for understanding the role the historian plays in shaping history. At just over 230 pages, if you have managed to read Thucydides' masterpiece, Kagan's critique would be a well worthwhile an illuminating walk in the park. Donald Kagan is the pre-eminent modern historian of the Peloponnesian War, and in this book, he retells the essential parts of the history in the context of Thucydides' aims. Kagan's essential point is that Thucydides, writing for a contemporary audience, is attempting to sway the readers away from popular interpretation of events toward the true, as he defined it, interpretation of events. He uses a number of artistic devices to do this - his selection of speeches and the juxtaposition of events foremost among them. To be specific, Thucydides is critical of direct democracy run by the mob, as opposed to the democracy led by Pericles. Kagan's argument is well-supported, and straightforwardly presented. For the reader without background in the Peloponnesian War, he presents complimentary history to go along with the argument. Kagan also, especially at the end, emphasizes that Thucydides presents the truth and makes an argument for its interpretation, as opposed to misrepresentation of the facts. In his analysis of the treatment of Nicias, he clearly articulates that Thucydides is sometimes less than successful.I highly recommend this book for the depth of its analysis, the clear presentation of the history itself, and the quality of Kagan's writing and research. The basic argument here is that Thukydides may well be decently reliable in his reportage, but that his interpretation of the events reported is subject to challenge on numerous counts, such as the causes of the Peloponnesion War, the effectiveness of Pericles, the meaning of Athenian democracy, the scope of the conflict, and the responsibility for the Sicilian disaster (i.e., Kagan makes a decent case that Thukydides' favorite, Nicias, should be cast in judgment). 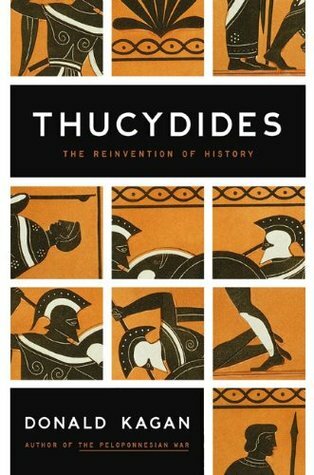 The fundamental tool of analysis is that Thukydides is a revisionist, even though he is the first true historian in the modern sense (Herodotos doesn't count for Kagan), which nicely renders all history as revisionism. The target of revision was, for Kagan, the conventional opinions of Athenians at the time of Thukydides' writing; Kagan does not fail to point out that Thukydides is himself not exactly sympathetic to Athens after his exile during the war.The text is short and sweet, and though I may prefer de Ste. Croix's reading of Thukydides, this is certainly worthwhile for ancient history nerds, art of war geeks, Alcibiades epigones, and Peisistratid apologists. I bought this book ages ago because I was fascinated by the idea of finding out more about Thucydides. I've read bits and pieces by the man, of course, although never all that much. The thought of having such a seminal figure put in his context and explored as a fallible man and amazing historian was alluring indeed.Alas, this is not the book I was expecting. It would be better titled Thucydides and the Peloponnesian War - which wouldn't have appealed to me as much, because I'm not quite as in love with the Peloponnesian issues as I am with, say the Persian, but that's beside the point. What Kagan has written here is overwhelming about the Peloponnesian War, with bits about Thucydides' perspective and how he's being a revisionist woven through that. Which is an entirely admirable project, but it is NOT what this book proclaims itself to be. So I was disappointed.Overall it's readable; fairly dense, but I haven't studied this era in ages and I am not a military historian, and I still got on relatively well. Thucydides is commonly held to be the first "modern" historian. Kagan persuasively adjusts that perception to frame Thucydides as the first "revisionary" historian, as well. By looking at the intra-texutal clues, and available other evidence, Kagan shows that much of Thucydides goal was to persuade or dissuade his fellow Greeks from their commonly held beliefs. An exploration of why Thucydides seemt to gloss over important events and spend inordinate time on less critical happenings, plus the rhetorical techniques and shading employed seem to support Professor Kagan's thesis. This understanding imposes a revision upon the thought of students of Greek history, who can no longer merely take Thucydides assertions a priori, but instead should apply the same critical thought, and using the same evidence that Thucydides shared with his readers, to try and understand the milieu of the Peloponnesian War. Kagan's popular-level introduction to Thucydides and historiography in general should be mandated reading for all students of history. This is a popular-level book that nonetheless introduces extremely nuanced issues in an accessible way. Kagan refutes the modern concept that "good history is unbiased history," and instead recognizes and lauds the integral role of the historian in history. It's only by recognizing and appreciating the authorial presentation that we can truly value the information provided. This maximalistic anti-modernistic interpretation is much needed in a world that asks "What is truth?" and very much doubts the value of text as useful in discerning historicity or fact. Pretty boring. It took me months to finish, and it didn't bother me. Not sure what I got out of this. Maybe I learned a little about the Peloponesian war(s)? Will I remember? He seemed to be trying to make a point about how Thucydides treated history different than others. But I think I missed that, too. I guess Thucydides was an exiled Athenian general, and part of the purpose of his writing was to present his side of the story. But most of it seemed to be focused on events he witnessed but didn't really take part in. The voice of the reader of this book on tape made it even more boring. An interesting read. Kagan argues that Thucydides was writing against the popular consensus of the day, and that his History should be treated as a revisionist work, and an partisan pro-Pericles work. Kagan does a good job of interrogating the silences and reading against the text of Thucydides. I'm still not totally convinced by some of Kagan's criticisms of Pericles and his sympathies with the Cleon, and I wish he had discussed Alcibaides, the most compelling figure in the history to my mind. Still, an enjoyable read. I'd recommend it to anyone who wants to learn more about the first great historian, whether they've already read Thucydides or not. I found that Kagan did a great job taking what Thucydides did and shown how he worked like any other historian, picking his topics and presentations.To say that he's really 'revisionist,' though I think is misleading. To me, you have to challenge other historians to be a revisionist; and Thucydides, working concurrently with his subject matter could be said to be something more akin to journalism than history.Kagan, I believe, is the true revisionist,challenging the hallowed name of his subject.I still think it was a great read, just had some problems with how it was all presented. This is a look at Thucydides that seeks to pierce through one of the most well-written texts of all time to critique or point out sometimes subtle shaping and arguments made in the book that are framed more as statements than the contentious view they seem to reflect.Does a good job marshaling other sources and keeping Thucydides personal role in events always in sight. Mileage may vary on each argument made by Kagan but overall a good backgrounder strongly thought tobebest read after reading Thucydides through. Not sure how to classify this one, as it's about a book or author, not a history itself (Thucydides). At any rate, I wouldn't read it until you've read Thucydides and ideally Herodotus, but if you have, it's extremely interesting. I'm reading more history of historians, lately, so this fits in well. It was pretty amazing so I'm going with the five stars. Kagan does an excellent job of examining what Thucydides actually says and even more importantly, what he doesn't say. In addition to a lucid explanation of the Pelopennesian War, you get a seminar in how historiography works. Check it out classic nerds. It is a thoughtful, provocative, and ultimately compelling argument suggesting that Thucydides, while an original and impressive historian, was also not without a biased agenda – which in many respects is in conflict with his own assessment of the Peloponnesian War. I am very happy to be in a book club that asks me to read things I wouldn't have read otherwise. I thought the Peloponesian War was right after the Trojan War until I read this. History books are not generally my thing but this was interesting. Kagan's intelligence and erudition are ever worthwhile. This isn't so much a biography of Thucydides as it is a biography of his great history of the Peloponnesian War, its ideas and influence, and also a fascinating look into the practice of history. Dense and academic. I guess you might expect that from a biography of Thucydides, but I have really come to enjoy a much more readable style of writing about dense and academic topics. Kagan is imminently knowledgeable, but his writing his challenging. Donald Kagan - Professor Kagan, who received his PhD from Ohio State University in 1958, has written The Great Dialogue: A History of Greek Political Thought from Homer to Polybius (1965 and 1986); The Outbreak of the Peloponnesian War (1969); The Archidamian War (1974); The Peace of Nicias and the Sicilian Expedition (1981); The Fall of the Athenian Empire (1987); Pericles and the Birth of the Athenian Empire (1990); On the Origins of War and the Preservation of Peace (1995); While America Sleeps (2000) with Frederick W. Kagan; The Western Heritage (2000) with Steven Ozment and Frank M. Turner; The Heritage of World Civilizations (2000) with Albert M. Craig, William A. Graham, Ozment and Turner; The Peloponnesian War (2003).Winner of the National Humanities Medal for 2002, and a prominent social and political critic, his graduate courses include seminars in the writings of selected Greek historians and in selected periods in Greek history.